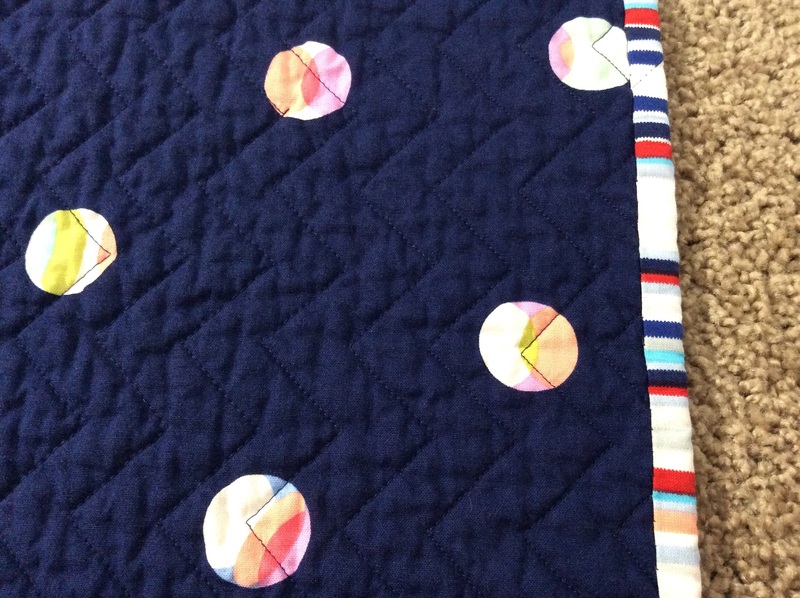 Over a year ago, I had an idea for a baby quilt with my friend E in mind for it. She was not even expecting at the time, but had once told me how much she loved the colors navy blue and pink. These prints just reminded me so much of her personal style. At the time, I had taken advantage of a great deal on several prints from the Paintbox collection by Cynthia Rowley for Michael Miller. (I used an aqua print for a Noodlehead Divided Basket as another baby gift) Unfortunately, the Paintbox collection is no longer available. I believe I paid between $4 to $6 a yard around December 2013. 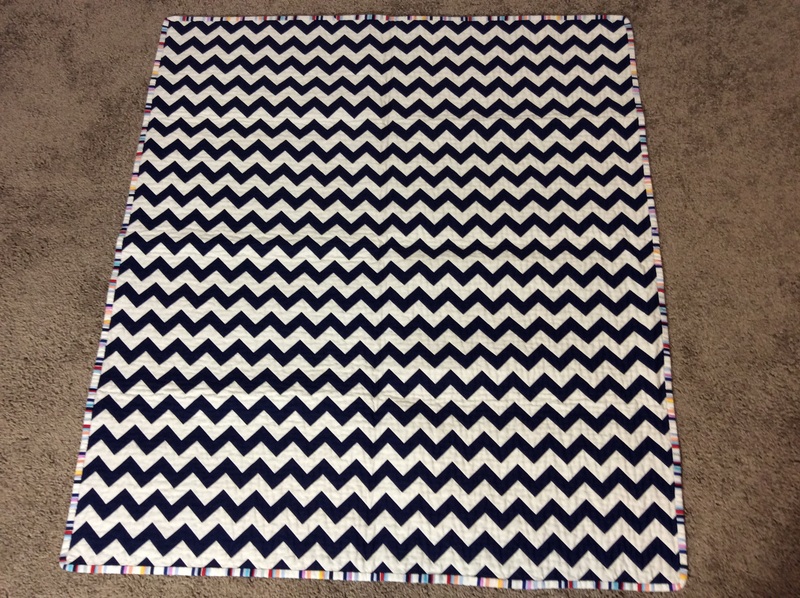 …And a navy and white chevron print on the other side. 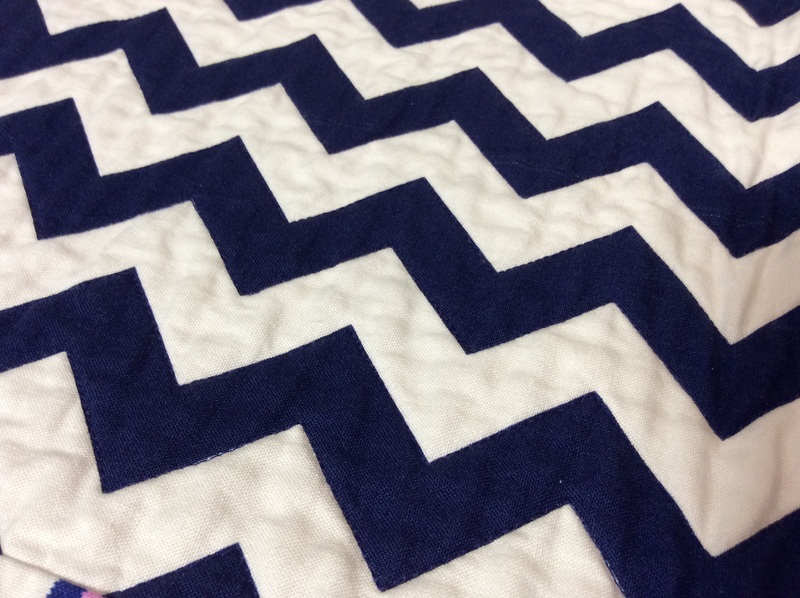 Using navy Aurifil thread, I simply quilted on each edge of the navy chevron zigzags. 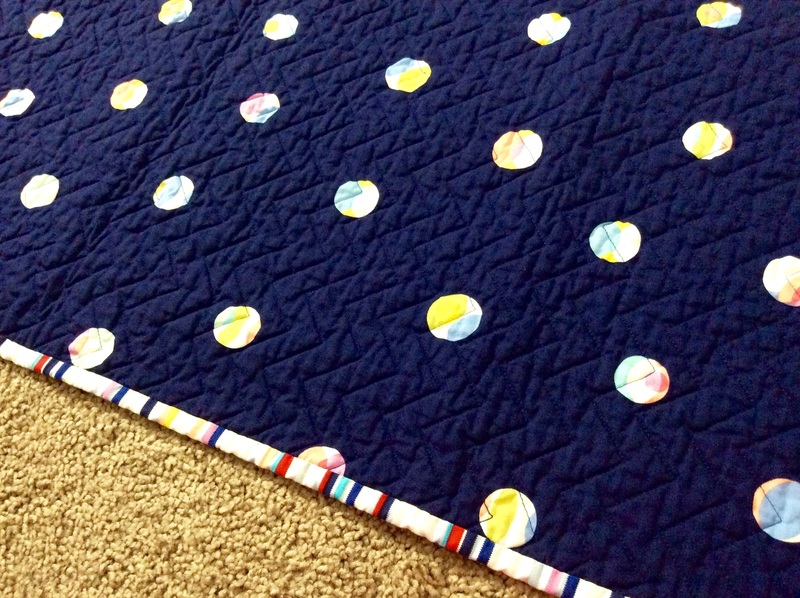 On the darker side of the quilt, the quilting creates a wonderful pattern. 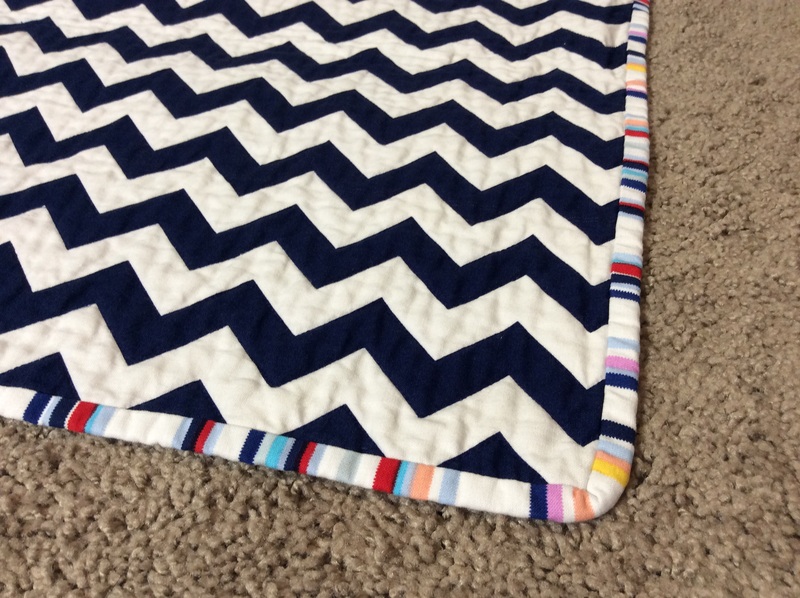 While there was no piecing involved with this quilt, quilting 43 zigzag lines more than made up for time spent on the project! The Paintbox collection is great for baby gifts. Some prints have dominant feminine colors, while others have gender neutral palettes. 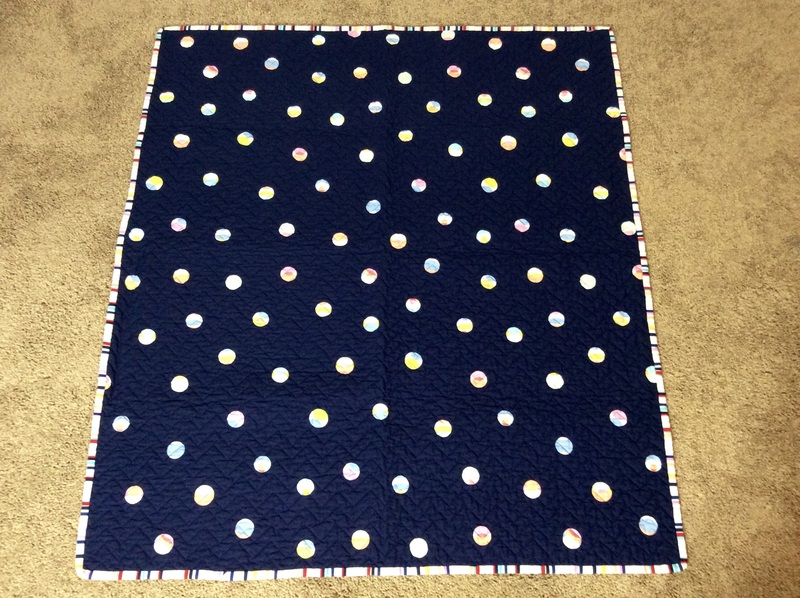 This navy print has printed dots featuring orange, yellow, blue, red, aqua, and pink. I made sure to pick up a couple yards of this striped print that I can’t get enough of. 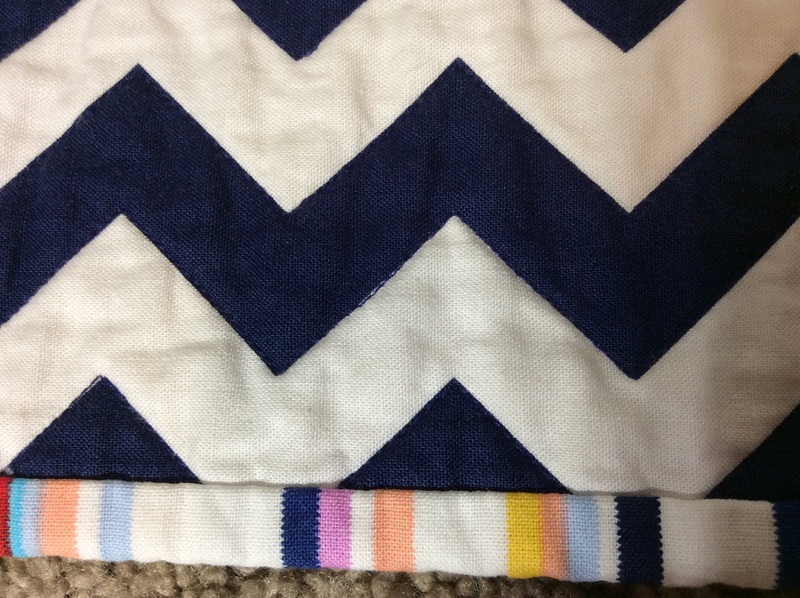 It’s so perfect for binding! My binding job looks good for my lack of experience, although I had not yet learned how to correctly do mitered corners so these are rounded. So why am I sharing this quilt now? Because E and her husband have just announced they are expecting their first little one! Last year they moved to another state to open up their own business, but E had always been so kind to me, supportive, and helpful when I was new to the Atlanta area. I would define her style as “Southern classic” – very traditional styles in bright and primary colors. When E left town, I decided I would hold onto this quilt for this milestone and then send it her way. Which is what I did this week.